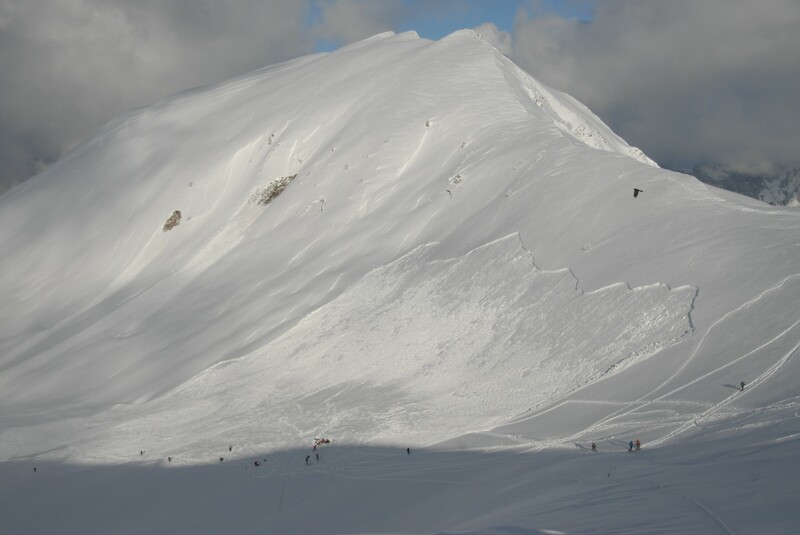 A couple of back country enthusiast triggered a slab avalanche close to the Col du Planbois on the north side of the Montagne de Sullens (1839 meters) near Manigod in the Aravis mountain range. The alert was given to the rescue services a little before 1pm and members of the Chamonix PGHM were dispatched to the scene. The victim, 60 year old woman, was found using probes. She was transported by helicopter to Annecy in a critical condition. Another person with the woman was unharmed. The couple had been snowshoeing on flat ground at the time and it appears the slide was remotely triggered from the slopes above. The avalanche risk is 3 (Considerable) in the area at present. The Aravis and the Montagne de Sullens are very popular with ski tourers and snow shoers. The normal route via the Combe de Sullens is considered “safe” by backcountry travellers when the avalanche risk is too high to ski elsewhere. Around 100 to 150cm of snow has fallen in the department at 2000m over the last week. with 30 to 40cm of fresh last night accompanied by a strong wind from the west to north-west. There are not too many problems with the internal structure of the snowpack at present with any residual weaknesses, principally on north sector slopes above 2200 meters, buried by the recent snow. There was an avalanche on the Envers du Pic, an off piste in the resort of Piau-Engaly today. Four Spanish and one French skier triggered a slab measuring 50 meters. Two skiers were taken by the slide. One was able to dig himself out, the other was trapped up to his waist in the debris. The other skiers were able to alert the piste patrol who called in the rescue services. Both victims were taken to the resort medical centre. The avalanche risk was 4/5. Here is a photo of the Sullen’s avalanche. That’s scary, relatively low angle, concave slope, and no obvious trigger. I guess the key issue was the 150cm of fresh and the strong wind. Hope the two victims are OK.
Dear Juice; 30 to 40 cm of overnight fresh plus wind plus 100 to 150 storm is three strikes, each a key issue. (Here the Alpha angle = what?) (17%?-22%? I dimly remember as the alpha slope range of concern, in degrees, not percentages as typed).